It was somewhere in an article by George Orwell that I came across the phrase “the solipsism of the sick man”, i.e. the inability of people mired in depression, disease or suffering to see beyond their own condition. Which is, I suppose a fairly natural thing. Even something as commonplace as a toothache has a way of making genocide in Rwanda or Darfur seem irrelevant at that moment. Our own life-and-death struggle, and concerns about China’s draconian crackdown in Tibet take up every bit of our time and attention right now, but we should spare a moment to consider the enormous and devastating tragedy that is playing out in Burma. Last time I checked the official death toll was 78,000. Many more have died according to other sources. I know some Tibetans have already donated money and offered prayers and butter lamps at the temple in Dharamshala. His Holiness has made a $50,000 donation. We must also spare a moment to contemplate the plight of Aung San Suu Kyi, the most fearless and committed fighter for freedom and democracy we have right now in the world. 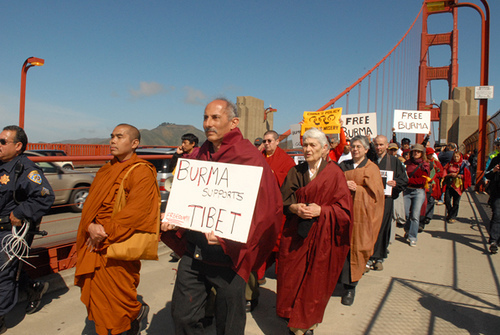 Tibetans, especially those in Chinese prisons for the cause of independence, have a genuine revolutionary bond with her. She remains a prisoner not just out of the viciousness of the Burmese military government, but because Beijing does not want her released. In 2000 a worldwide campaign for a consumer boycott and shareholder pressure forced companies like ARCO, Eddie Bauer, Liz Claiborne, Macy’s, Reebok and Petro Canada to withdraw from Burma. In January 2001, the Burmese military junta finally agreed to enter into negotiations with Aung San Suu Kyi. On 6 May 2002, following secret confidence-building negotiations led by the United Nations, the government released her; a government spokesman said that she was free to move “because we are confident that we can trust each other”. Aung San Suu Kyi proclaimed “a new dawn for the country”. However on 30 May 2003, a government-sponsored mob attacked her and her supporters in the northern village of Depayin, murdering and wounding many of her supporters. 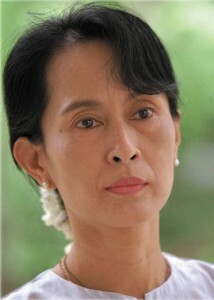 Aung San Suu Kyi fled the scene with the help of her driver, but was later arrested. The government imprisoned her at Insein Prison in Yangon. What happened? China realized that the economic sanctions and pressure from the West was forcing the Burmese regime to release Suu Kyi, and perhaps even allow some possible measure of democratization in the country. So Beijing stepped in with massive investments, trade and arms supplies to the regime that effectively cancelled out the effect of the West’s sanctions. China has since been effectively blocking all discussion and action against the junta in the United Nations Security Council, and vetoing all resolutions calling for the release of Aung San Suu Kyi and other political prisoners. It has also effectively managed to water down discussions and block resolutions in other international forums, especially those condemning the junta’s murderous crackdown on monks and democracy activists in the wake of last year’s anti-government demonstrations. Even a partially democratic Burma threatens China’s very profitable exploitation of Burma’s oil and gas resources. It also puts at risk China’s naval access to the Indian Ocean, which is a vital part of its “string of pearls” strategy to project Chinese military power in Asia and the Pacific. There is also the concern among Chinese strategic thinkers that a popular or democratic upheaval in Burma could have a ripple effect in Tibet, East Turkistan or even North Korea, and threaten the Chinese Communist Empire and its surrogate dictators in some Asian nations – which are fast becoming China’s new economic colonies. Hence Aung San Suu Kyi is as much a prisoner and a victim of Beijing’s tyranny and power schemes as any one of the thousands of Tibetans now incarcerated throughout Tibet. The Amnye Machen Institute published a Tibetan translation of Aung San Suu Kyi’s, Freedom From Fear, in 1997. AMI director Tashi Tsering la wrote the introduction. He knew Suu Kyi and her husband Michael Aris, the eminent scholar on Bhutan and Tibet. Tashi la mentions that when she was married in 1972 at Oxford, she wanted to observe the Burmese custom of having a monk blow on a conch shell, the sound of which Buddhists believe is auspicious and drives away bad luck. No Burmese monks being available, one of the first Tibetan lamas in the West, Chime Rimpoche, was inducted to perform the task. When Michael Aris was diagnosed with prostate cancer in 1997, the Burmese government denied him an entry visa to the country. They told Suu Kyi that she could leave Burma, but she knew that if she did they would never allow her back. Michael died in 1999. He was a good friend and supporter of Amnye Machen and as an act of remembrance we printed a scholarly article by him in the AMI web-journal, HIGH ASIA. Aung San Suu Kyi has two sons, who accepted the Nobel Peace Prize for her. She remains separated from her children, who live in the United Kingdom. It is a lot for one person to have to give up, even for so noble a cause as a people’s freedom. And she has her critics and detractors. I came across a couple of articles speculating that her actions might be causing more suffering than good for the Burmese people. That it might be a better idea for her to leave the country. That free trade would, anyhow, eventually bring about democracy and freedom to Burma. The same sort of speciously “concerned” theorizing that the Tibetan issue regularly receives. But Suu Kyi seems unmoved by it all: death threats, a possible lifetime of confinement, personal anguish, and the flattering but false appeals to her intelligence, humanity and stature as a Noble Prize winner to end the confrontation and seek a more amenable way (outside Burma) to continue her fight for Burmese democracy. But even the seeming lack of any progress in the struggle for the last so many years, does not appear to have diminished her resolve. Her determination is, as Tibetans would say, “embedded in the ground like a boulder” (drak tsugpa nangshing). This is one person I admire without reservation.